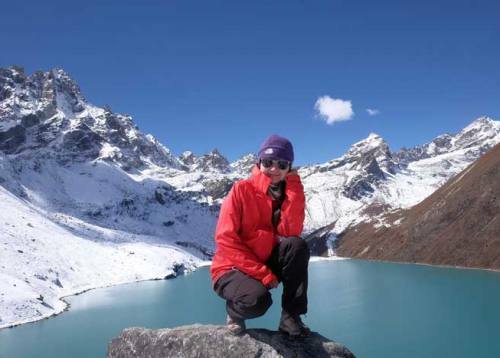 Gokyo Lake Trek is one of the most beautifully located landmarks of Khumbu region. 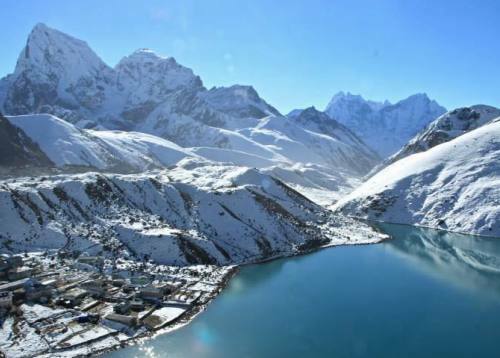 Gokyo is the home of Nepal’s largest glacier ‘Ngozumba’ and many other stunning glacial lakes. 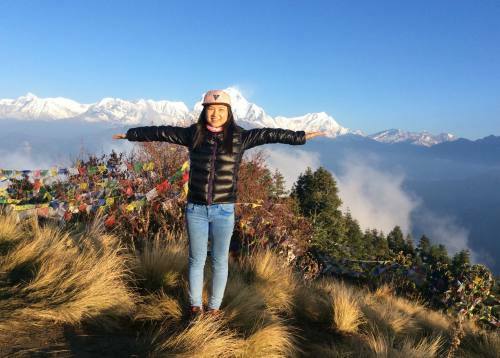 The charming view of marvelous mountains including Mount Everest (8,848m), Cho-Oyu (8,201m), Lhotse (8,516m) and Makalu (8,481m) is the most fabulous feature of the place. Join our 14 days Gokyo Lake Trekking; we will bring you to the top of the world. The Gokyo lake trek starts with the super scenic flight from Kathmandu to Lukla (2,840m) and extends towards the impressive Himalayas of Everest region. Phakding (2,652m) would be our first day destination which becomes Namche (3,440m) for the next day. Namche is the most dramatic and developed Himalayan town of Nepal. 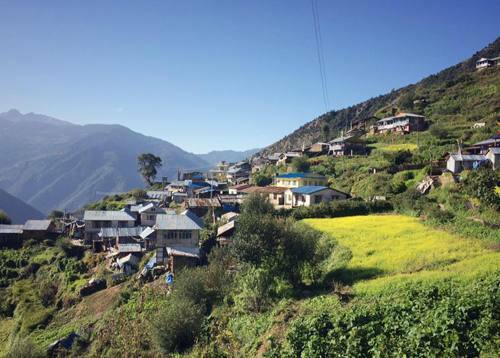 We stop at Phorse and Machhermo village before we reach to the prime destination Gokyo valley. We appreciate the great view of lakes, glaciers and mountains from Gokyo Ri. Gokyo lake trek is design by concerning those seeking to meet the tallest mountains, biggest glaciers, lakes, remote peoples and lifestyle. If you want so, don’t think anymore, you are always welcome in this country of Himalayas. After breakfast, proceed for sightseeing tours to world heritage sites of Pashupatinath Temple-the holiest Hindu Temple on the bank of sacred Bagmati River, Bodhanath Stupa-the biggest Buddhist Stupa architecture in the world! Patan Durbar Square is the oldest city in the Kathmandu valley with age old tradition also called Lalitpur-the city of fine arts. The visit covers the Durbar Square, the Krishna temple, the Kumbheswore temple, the Golden temple and many more. Swayambhunath Stupa-the 2000 years old legendary stupa on the hillock also nick-named as monkey temple. Your day tour ends Kathmandu Durbar Square Showcasing living goddess Kumari Temple, Nautale Durbar, the Kaal Bhairav, the Swet Bhairav, the freak Street and more. Overnight in hotel. Day 5Namche Bazaar: Acclimatization and exploration day. Another scheduled rest day is stipulated to guard against AMS. Gokyo offers two major viewpoints.The first is Gokyo Ri (5,360m/17,586ft) which begins on the northern side of the lake, opposite the village. 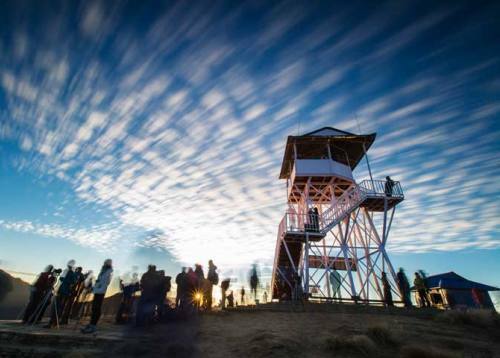 Its panorama invites an early start and involves a two hour climb to its summit. 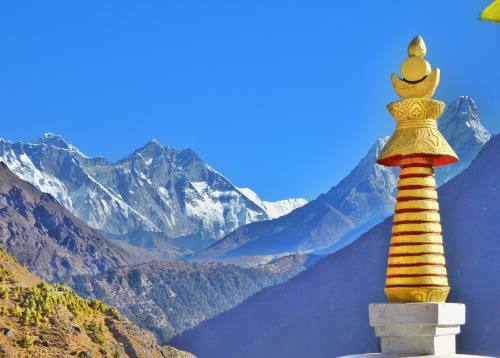 It overlooks the broad, rubble-covered Ngozumpa Glacier, Nepal’s longest, gouged out beneath a wall of towering peaks on its south-eastern flank. 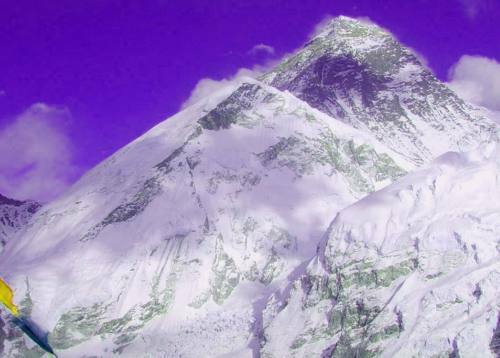 From the flag bedecked summit is the unforgettable vista of the Himalayan chain that includes Cho-Oyu and Ghyachung Kang, the north face of Everest, Lhotse, Nuptse, Makalu, Cholatse, Taboche, Thamserku, Kangtega, Kusum Kangru (all over 6,300m/20,670ft) and many more, some unnamed. The second attraction explores the fourth to sixth lakes north of the village. These lakes, together with melt water from the glacier are the source of the Dudh Koshi: followed from Lukla. 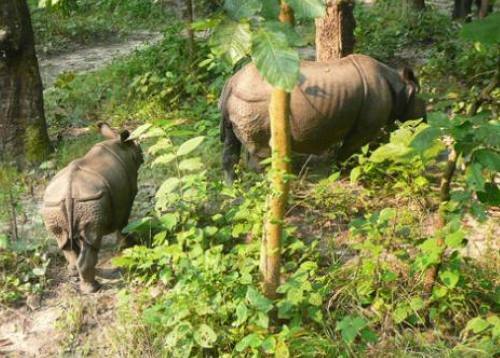 Rather than retrace the upward route, follow the eastern side of the valley to gain different views of Khumbila. This path also offers warmer weather, as the sun stays on these slopes longer in the late afternoon. A slippery trail descends from Phortse to the bridge at Phortse Thenga and then rejoins the original route from Khumjung. It is easy to reach Namche Bazaar and then descend to the Dudh Koshi for a lower final night. After breakfast retrace your steps to Phakding, cross the suspension bridge at Thado Koshi, walk on to Cheplung and round off the adventure with the final 700m/2,300ft, 35min ascent to Lukla: and say goodbye to your porters. Overnight in Lukla at Lodge. All personal expenses like alcoholic beverages, bottled drinks, telephone calls, laundry services etc. Eating is a big part of Holiday. 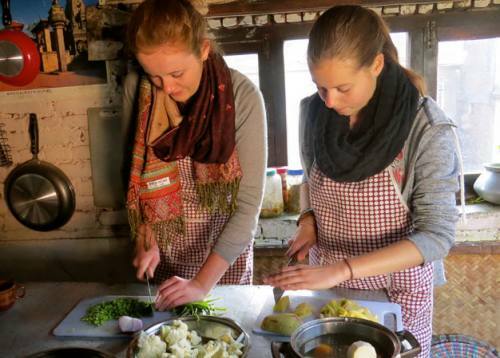 Travelling with Mount Trails , you experience the vast array of wonderful local fresh Nepalese , Chinese, Continental, Italian and several local cuisines. Breakfast, Lunch & Dinner are included in the package. Your guide will suggest delicious, hygienic and each place special food during your trip. Mountain restaurant owner prefer not to order many dishes and waste food as they would like to cater more trekkers with limited food before run off stuck. 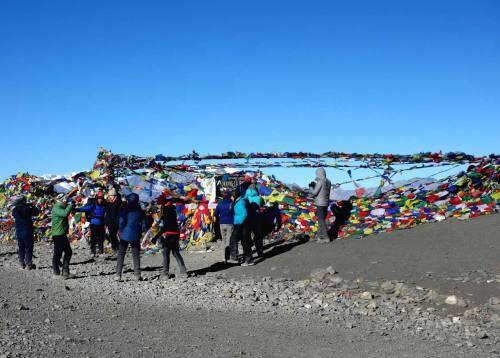 Its a week or more days hard work to porters and caravans to bring food to these places. 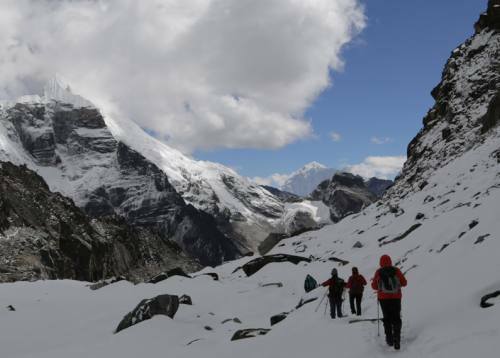 During this trek you will usually have breakfast and dinner at the same Lodge, lunch will be eaten at one of the trail side restaurants en-route. 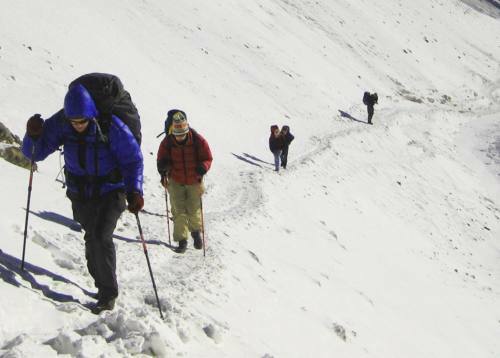 Mount TrailsnTrekking and adventures offers you complementary route map of the trekking region. This is a very active trip, meaning you will be on the move most of the time, so pack as lightly as possible. We provide one porter for every two travellers; your trekking gear will be carried by the porter in a duffel bag that we will provide. 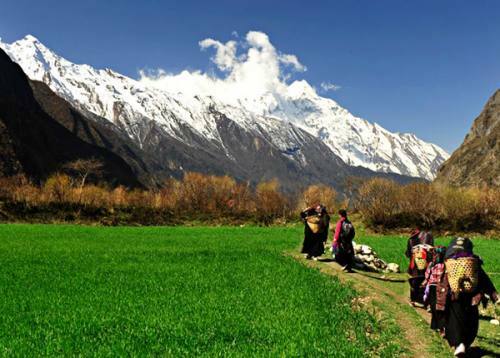 The maximum the porters are allowed to carry 15 kgs per trekker means 30 kgs from 2 trekkers . Unnecessary luggage can left in Kathmandu Hotel and its absolutely free of cost. . Please read the Checklist section of this trip notes for additional details of what you need to bring for the trek on this trip. You will need to bring a comfortable medium sized day pack to carry the things that you will need during the day. This should have a waist strap or (better) a padded waist belt. The weather is subject to change in high altitude so layered clothing is recommended throughout the year.